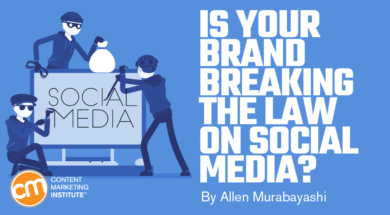 Social Media Law: Are You Breaking It? Ambiguous rules and lax enforcement of resharing original content on social media has perpetuated the theft of the creators’ intellectual property. But that’s changing as the creative class – photographers, videographers, musicians, et al. – are more likely to enforce their legal and moral rights in the growing multibillion-dollar social media industry. If your brand doesn’t rely solely on commissioned or in-house content, you could have potential legal exposure from the images you use on social media. That’s why you might want to rethink or at least review your social media content policies. U.S. copyright law provides statutory damages up to $150,000 per image for willful infringement. And, though you may not read about a lot of court decisions on copyright infringement, remember many cases are settled out of court, never to be shared publicly. Mitigate your and your brand’s risk by understanding some key intellectual property (IP) insights and following a few hints I’ve found helpful even though I’m not an attorney. Google Images has a reverse image search feature that allows users to click on the camera then upload an image and view the websites using that image. Companies like Getty Images automate similar technology to find instances of unlicensed use and automatically dispatch letters seeking compensation for commercial infringement. Here’s one way to respond if you get a copyright infringement letter. Technological improvements will continue to make it easier and cheaper for content creators to find stolen images, and properly licensing images is a simple way to avoid costly penalties. Do this: License your images from stock photo sites or directly from photographers to avoid potential liability. Use a digital asset management (DAM) system to track your content licenses. Tagging the originator of an image doesn’t give the poster a legal license to reuse content. And given that images are reposted then reposted then reposted, original attribution often is lost. In other words, you might not only illegally post an image, you might credit the wrong person or brand. A large fashion publication with 3 million followers recently reposted an image that appeared on the Instagram account of French hotel Domaine des Hauts. It didn’t seek permission or credit the photographer. Perhaps the media outlet thought it was OK to repost the image without permission because it was a marketing image. But fans of the photographer Jamie Beck recognized the reused image and cried foul. Although the publication quickly removed the image and licensed another one from the original photographer to the satisfaction of both parties (and their followers), the incident is a prime example of how the appearance of a brand’s content in social media isn’t a blanket license for others to use at will. Do this: Avoid reposting other user’s content, even marketing-related content, unless you have explicit permission. Examples of commonly accepted fair use include but aren’t limited to educational purposes, criticism, and satire. Brands rarely repost images under these contexts, thus their use is unlikely to pass the fair use test. Images from or about the news and celebrity images are frequently reposted without permission. Neither is considered fair use. In fact, there’s a decent amount of case law supporting the rights of the creative creators. Even reusing an image of your brand or you may not constitute fair use. Model Gigi Hadid posted a photo of herself taken by Peter Cepeda to her Instagram account. Presumably, she believed she had the legal right to publish a photo of herself. But the photographer sued for copyright infringement, and the case was settled out of court. Infringement gets murky when someone uses another brand’s content (e.g., product or campaign image) on their blog or social media post. From a legal standpoint it shouldn’t be done because the republisher doesn’t know the licensing terms between the original brand and the content creator. Though, from a practical perspective, brands usually want their content shared, so it’s unlikely that this usage would run afoul. But you never know. Use Google Images to see if the image is original to the brand. Checking the provenance (e.g., did it come from the brand’s website?) can mitigate your risk. Do this: Don’t rely on fair use as a reason to avoid paid licenses. Create and enforce a content licensing and permission policy. Brands love user-generated content (UGC) because it’s free and builds affinity. There are many methods of collecting UGC (e.g., contests that require users to agree to a set of terms and conditions – one of which is giving the brand the rights to the UGC). Some brands rely on hashtags to cull UGC content, then use the hashtag as evidence of permission to repost. Calvin Klein’s ongoing #MyCalvins campaign generates a seemingly endless supply of attractive millennials looking to become Insta-stars. One might plausibly argue the hashtag is specific enough that a consumer wouldn’t randomly use it without knowing it was part of a UGC campaign. (And Calvin Klein likely seeks explicit permission before it reposts on its Instagram account of 1.3 million-plus followers.) But I don’t know of any case law to suggest a hashtag alone represents a usage license, and brands need to be careful about interpreting it as such. Hashtags provide user-generated categorization – an incredibly helpful taxonomical device that enhances discovery on social media platforms like Instagram and Twitter. But brands need to be careful in assuming the presence of a hashtag equates to permission. It almost certainly does not meet the threshold in most cases. Do this: Even if you encourage your audience to use brand-specific hashtags, seek written permission from the content creator before reposting. And Instagram’s API Platform Policy prohibits violating other users’ rights. In 2015, Groupon was hit with a class action lawsuit for stealing location-tagged photos from Instagram and using the images to promote those businesses with Groupon deals. Interestingly, the main claim wasn’t copyright infringement, but using a person’s likeness (rights of publicity) to promote a business without the person’s consent. Do this: Always obtain permission before reposting content. Tagging and/or adding a copyright disclaimer won’t provide you legal cover in infringement cases. The threat of lawsuit has forced the largest social media and content-sharing platforms to automate copyright infringement detection and monetization capabilities. For example, YouTube allows musicians to “cover” popular songs without obtaining a mechanical or synchronization license because they have deals in place with some of the major music publishers to automate the process. Automation simplifies accounting, but the artist might incorrectly believe that no licensing is necessary to use someone else’s intellectual property since the process is obfuscated. There’s no substitute for directly obtaining a license and using a system to manage compliance. The average consumer rarely deals directly with licensing so it’s easy to be ignorant of the law. But the risk for brands is undeniably high. A corporate content policy is a starting point for risk mitigation (and don’t forget to involve your legal counsel). Technology is playing a growing role in copyright infringement monitoring and enforcement. Be one of the first to learn about how those issues will be tackled in 2019 at ContentTECH. Sign up today to be notified when registration opens. Allen Murabayashi is the chairman and co-founder of PhotoShelter, the worldwide leader in visual asset management for professional photographers and organizations. Allen previously served as a founding employee and senior vice president of Engineering at HotJobs.com, where he assisted in the company's massive growth from a 4-person start-up to a publicly-held company with over 675 employees. He oversaw a staff of 50 engineers, and was responsible for the development of HotJobs.com, Softshoe, and a number of internal applications. For more copyright tips and definitions, check out Copyright 101: A Glossary for Marketers. Follow Allen on Twitter @allen3m.